Healthy banana pumpkin cookies are the best fall recipe! This AIP, paleo, vegan and no sugar added recipe makes soft and chewy cookies with a sweet spiced flavor. These healthy banana pumpkin cookies make a great dessert for the holiday table when pumpkin is in season, or for parties or to pack up as gifts. They’re paleo, AIP, vegan, gluten free, dairy free and sugar free, so enjoy them without worrying about unhealthy ingredients! If you are on a special diet like the autoimmune paleo protocol (AIP), these are free of eggs too! If you are on the autoimmune paleo protocol diet (AIP) desserts can sometimes be difficult to make since you have to avoid nuts, eggs, seeds and some spices. So this recipe is a fun egg-free, nut-free treat for those who are on AIP. Even if you are not on AIP, this is a tasty, sweet and chewy spiced cookie that is perfect for fall! The addition of banana acts both as a natural sweetener as well as an egg-free binder to keep everything together. If you are on AIP, you’ll want to use chopped dates with this recipe–it really makes the recipe! If you are not on AIP, you can use chocolate chips in place of dates. I have tried both ways. Usually I am chocolate-obsessed, but I actually prefer dates for this recipe…it really pairs well with the other flavors. If you are on AIP, don’t use pumpkin pie spice. Substitute equal amounts cinnamon. I’ve updated this recipe so you can make it without coconut butter since not everyone has that on hand. However, if you have coconut butter, I would recommend adding 1 tbsp to your cookie dough mixture to further add to the perfect texture. The banana is an important part of this recipe and should not be substituted since it adds sweetness and acts as an egg-free binder. Tapioca flour can be substituted with arrowroot or cassava flour. The coconut flour cannot be substituted. It’s important to use parchment paper or a silpat on the cookie sheet when making these so they don’t stick. Store these cookies in the refrigerator or freezer. They will last about a week in the refrigerator. First, peel a medium sized ripe banana then smash and puree it with a fork (you can also mix it in a food processor). Then add pureed pumpkin. Add in all of the remaining ingredients except the chopped dates (or chocolate chips). Mix everything together. Use a food processor or hand blender to combine thoroughly. Add in the chopped dates or chocolate chips and fold in with a spoon. Drop 12 mounds of cookie dough evenly on a baking sheet lined with parchment paper or a silpat (this is needed to prevent sticking). Use a spoon to evenly flatten and shape the cookies. They won’t rise very much, so take care to shape them in the way you want them. They will cook better if they are flatter. Bake at 350° for about 10-15 minutes. Since they are egg-free and AIP, they won’t be quite the same as regular cookies. They will be a chewy floppy texture. Enjoy with some hot cocoa or hot apple cider for the perfect fall treat! Pre-heat the oven to 350°. Use a blender, food processor or stick blender to mix all ingredients except the dates (or chocolate chips). If using the dates, chop the dates. Add the dates to the batter and stir gently with a spoon. If using chocolate chips, add them to the dough and fold into the dough. Place parchment paper or a silpat on a cookie sheet (you need parchment paper or else the cookies may stick). Place spoonfuls of the cookie dough onto the cookie sheet. The batter will be more moist than regular cookie dough. Use the spoon to shape the batter into a flat circle cookie shape. Repeat until all of the batter is out. Bake the cookies at 350° for about 10 minutes or until a toothpick inserted comes out clean. If you are on AIP, you'll want to use chopped dates with this recipe--it really makes the recipe! If you are not on AIP, you can use chocolate chips in place of dates. I have tried both ways. Usually I'm a chocolate fiend, but I actually prefer dates for this recipe...it really pairs well with the other flavors. If you are on AIP, do not use pumpkin pie spice. Substitute equal amounts cinnamon. I've updated this recipe so you can make it without coconut butter since not everyone has that on hand. However, if you have coconut butter, I would recommend adding 1 tbsp to your cookie dough mixture to further add to the perfect texture. It's important to use parchment paper or a silpat on the cookie sheet when making these so they don't stick. 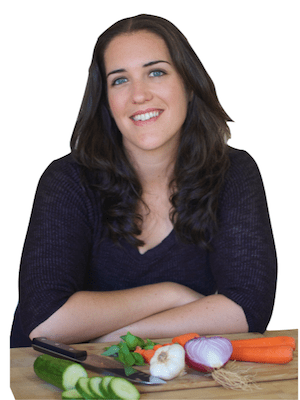 Want Even More Delicious Sugar Free Paleo Recipes?? Now you can satisfy your sweet tooth and stay on track of your healthy diet with indulgent delectable paleo sweets and treats that are SUGAR FREE. My book Sugar-Free Paleo Desserts can help you stick to your sugarless lifestyle without feeling deprived of the joys of the occasional sweet treat. Each recipe has been crafted to bring out the sweetness and flavor that the natural sugarless ingredients have to offer. 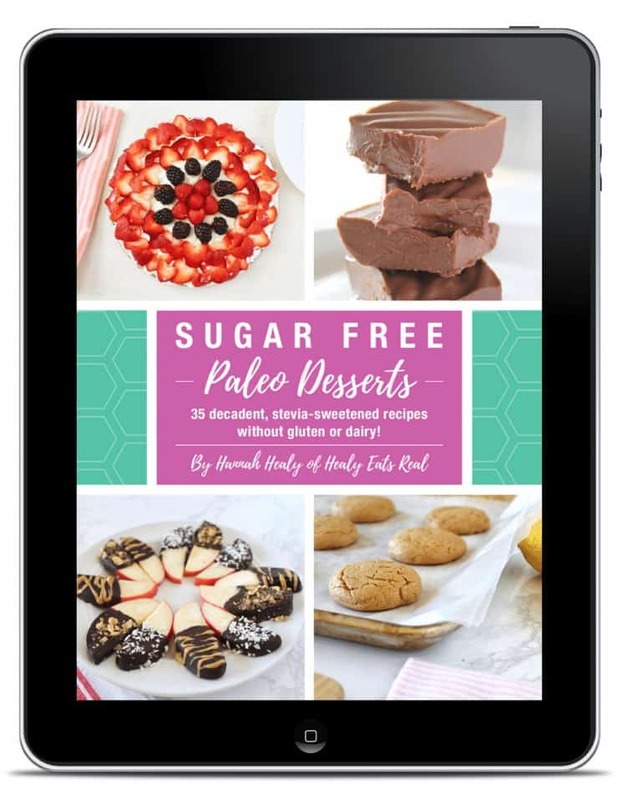 Click here to get your copy of Sugar Free Paleo Desserts! All 35 recipes in Sugar-Free Paleo Desserts are gluten-free, grain-free, dairy-free and sugar-free…but you wouldn’t even be able to tell from the decadent richness of the 3-ingredient fudge or the creamy brightness of the coconut cream fruit tart. ♦ Cookie Dough Balls …AND MORE! 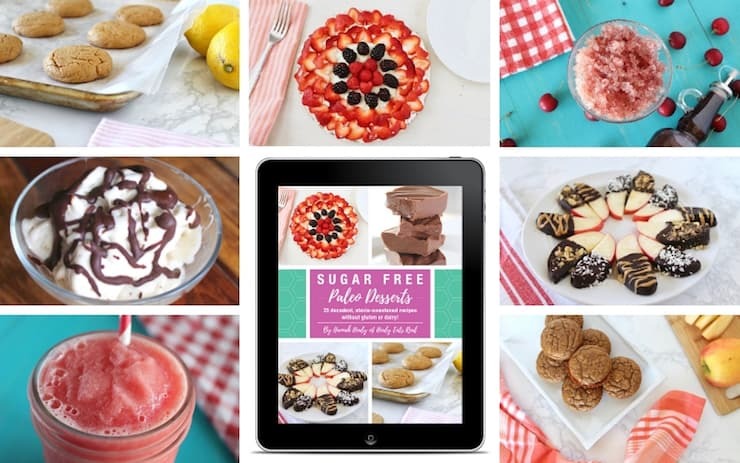 My Sugar Free Paleo Desserts ebook provides the flavorful nutritious recipes that hits the sweet spot every single time…all without added sugar! This Healthy Banana Pumpkin Cookie recipe was originally posted in September 2017, but has been republished in September 2018 to include new and improved recipe tips and a new video. My kids love this time of year when the pumpkin muffins and cookies are on the counter after school. Bonus that these are healthy. Love it…no guilt eating these cookies. Love pumpkin cookies! These look thin and crispy – just perfect for dunking in coffee, now I’m ready for fall! Delicious cookies and a wonderful recipe! These cookies are making my mouth water 🙂 I just love pumpkin and have not tried baking pumpkin cookies. So yummy! What a delicious fall cookie! I have coconut flower and tapioca flour in my pantry and really don’t use it very much. Glad to have something to make with it…and my kids will surely love these too! Thank you so much! I don’t have a great pumpkin cookie recipe and I love this one. Can’t wait to make it! I am in love with this recipe.It’s delicious.I made it and it turned out great. Pinned!! I can’t wait to give these a try. I usually follow a paleo diet and with fall finally here, I’m all about anything pumpkin! Can any other flour be used if I don’t have coconut flour? No, there aren’t really any good subs for coconut flour since it’s so unique. It would change the whole recipe. These look awesome! We have a banana allergy in our home. What could we substitute for it? can I use corn starch instead of tapioca flour? These sound wonderful. I take it the chocolate chips are optional, since they’re not AIP compliant? Yes, the chopped dates take the place of the chocolate chips for the AIP version. I made these. They tasted good but they were robbery. Is that the tech sure it’s supposed to have? Yes, since they are egg free and AIP friendly the texture will be a bit different than regular cookies. My best friend is on the AIP protocol and she’s always looking for snacky things that satisfy. Sharing this one with her! Awesome! I think she’ll enjoy them! These are calling my name! They look so tasty! Thanks! They are super fun! I can’t wait to try these. Pumpkin cookies sound terrific! Yum! I’m looking forward to all the pumpkin recipes right now and these cookies sound amazing! I am pretty sure that these little cookies would not last long on our counter. We both love bananas. And duh. Cookies. This is exactly the recipe I have been looking for. Any chance very ripe plantain could be used in place of banana? I’m not sure, I haven’t tried that, but let us know if it works out! I made these and the outside was cooked rubbery but the inside seemed uncooked. Did not look like your picture at all which looks luke a crunchy cookie. Why so different I wonder. Mary, I state several times in the post that the cookie texture is chewy. It’s never described as crunchy. This is a nut-free and egg-free autoimmune paleo recipe so the texture is different than when you use eggs and nuts. Yummo!! I am imagining that lovely chewy texture! Are these 44 calories each? Amazing thanks! Excited to try em!